In celebration of Archives Month, the King County Archives will be setting up in the lobby of King County’s Chinook Building! We will be sharing exhibits, information about the collection, archival film and video footage, and even some Archives-themed swag. Donations will go to Project HOPE, to help hurricane victims in Puerto Rico. Assistant Archivist Jill Anderson drops in on the King County Assessor’s Office, circa 1936. That evening, head up the hill to the Douglass-Truth Branch of the Seattle Public Library in Seattle’s Central District, and join the King County Archives, the Seattle Municipal Archives, and Seattle ARCH (Activists Remembered Celebrated & Honored) for stories of local activism, as told through archival records. Learn the histories of local organizing against new freeways in the 1960s and 1970s, Seattle’s open housing campaign, the citizen-led movement to have the King County logo changed from a crown to the likeness of Dr. Martin Luther King, Jr., and more, from the recent and not-so-recent past. Archives Month may end on October 31, but we will continue celebrating! Mark your calendars for another Archival Screening Night on Sunday, November 12, at the Northwest Film Forum. Happy hour starts at 6:30pm, show begins at 7:30pm. For this showing, we will be contributing more gems from the Kingdome collection. Clipping from the Seattle Times, June 19, 1976. Series 45, King County Executive John Spellman Clipping Files, Box 8, Folder 16, King County Archives. Forty years ago, the 1976 Bicentennial, commemorating the 200th anniversary of the signing of the United States Declaration of Independence, inspired projects celebrating American history and heritage, civic engagement, and community service. 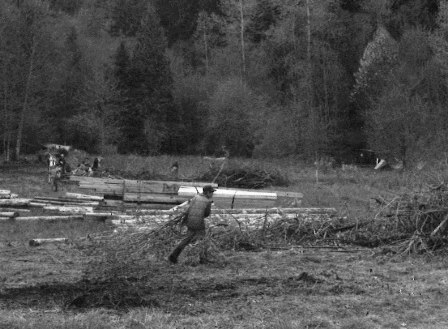 One of the largest and most ambitious Bicentennial projects in the country happened at a King County park in the spring of 1976. 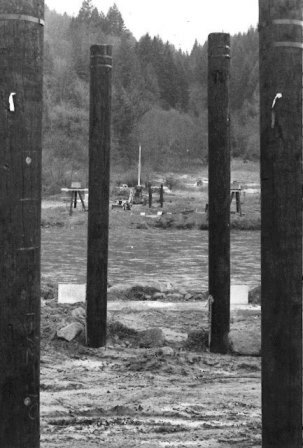 In 1973, King County had opened the Tolt River Park and campground near Carnation, on the east side of the Snoqualmie River where it was joined by the Tolt. Undeveloped park property also lay on the west bank of the Snoqualmie River. A connecting footbridge was envisioned but not initially built. Aerial park site view, circa 1975-1976. The park is in the angle formed where the rivers meet. 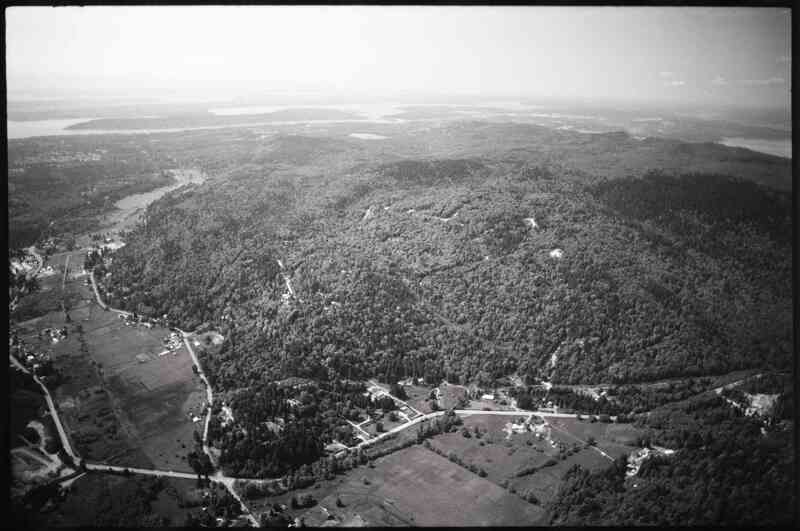 The undeveloped west portion area is the forested hillside in the upper left side of the photograph. Series 467, Park System Photograph Files, Box 6, Folder 25, King County Archives. John MacDonald: photo printed in park dedication program, Series 468, Park System History Files, Box 1, Folder 63, King County Archives. 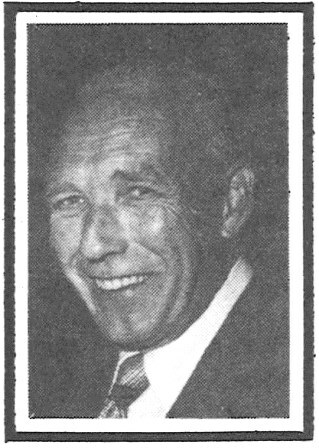 In 1974, Seattle banker John MacDonald approached King County government with an idea. 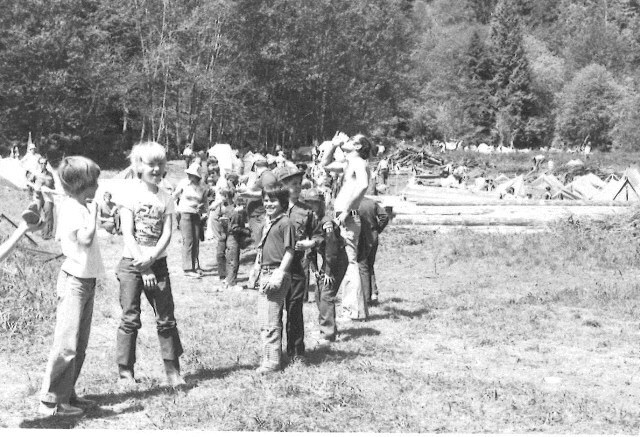 President of the Chief Seattle Boy Scout Council and a longtime leader of his own church-sponsored Scout troop, MacDonald proposed a Bicentennial project involving all the area’s Boy Scouts. His idea? Scouts would develop trails and campsites on the west bank of Tolt River Park, and the U.S. Marines would build a 500-foot pedestrian bridge across the river. “Just the type of cooperative project that we have been striving for!” — King County Executive John Spellman to the King County Council. But the Chief Seattle Council of the Boy Scouts of America first had to persuade its 12 component districts to turn their annual “camporees” into work parties. After eight months, 45 meetings, and two scale models of the site (built by Eagle Scouts), everyone agreed. By early 1976, 18 months of planning had resulted in an ambitious six-weekend construction schedule. 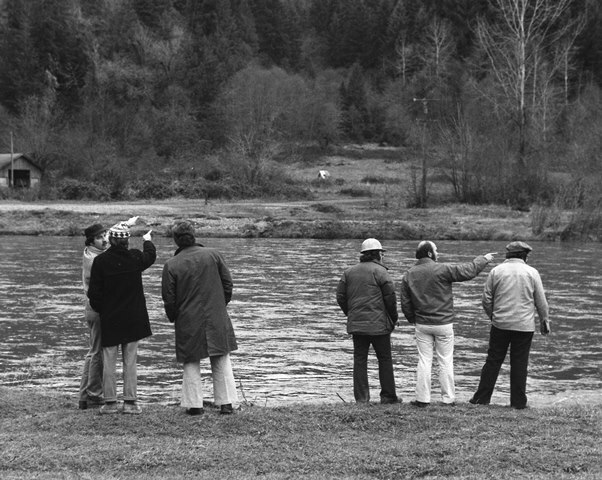 King County Parks Department representatives brief the public relations committee of the Chief Seattle Boy Scout Council at the Snoqualmie River bridge site, January 9, 1976. Series 467, Park System Photograph Files, Box 6, Folder 25, King County Archives. U.S. Army Reserve Brochure, Series 468, Park System History Files, Box 1, Folder 62, King County Archives. Bridge construction would be led by the Army Reserve’s 409th Engineer Company, an Everett-based unit under the 124th Army Reserve Command in Seattle. They would be assisted by the Regular Army, the Marine Corps Reserve, and the 6th Field Engineering Squadron from North Vancouver, British Columbia, who worked on an exchange basis with the 124th. All units operated under regulations allowing for domestic action that provided community services. 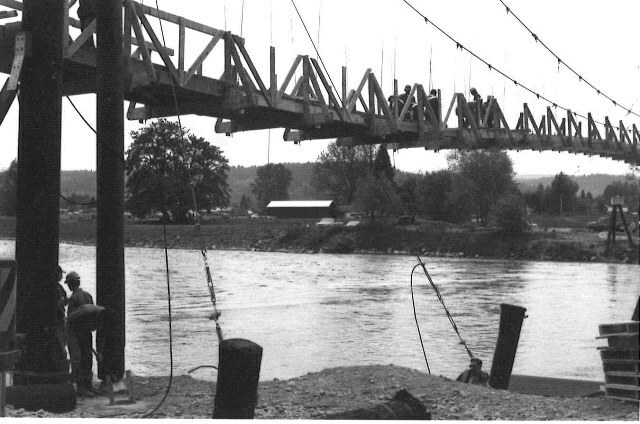 Building a suspension bridge was also a training exercise for the 409th. 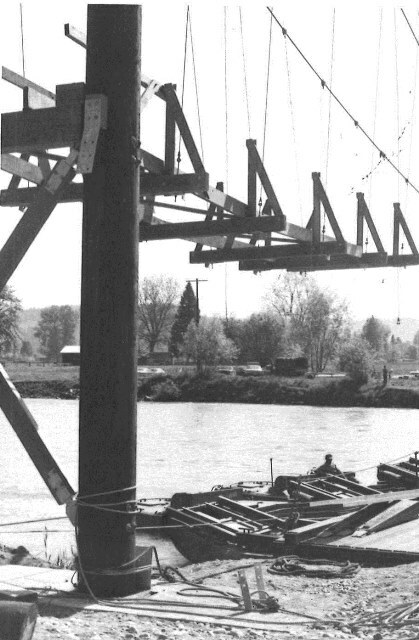 Plans came from the Army’s Technical Manual 5-270, with modifications: larger handrails, anti-sway cables, heavier footings, improved cable anchor design, and additions to increase flood, wind and earthquake resistance. The bridge was built to last at least forty years. Engineering drawing for the bridge. Series 468, Park System History Files, Box 1, Folder 62, King Count Archives. In cold rain and hail, on April 24, 1,500 Scouts from the Shoreline and Viking (northwest Seattle) Districts and 400 leaders and parents turned out. April 24-25: First task: to clear 23 campsites of ten-foot high brush and devil’s club. 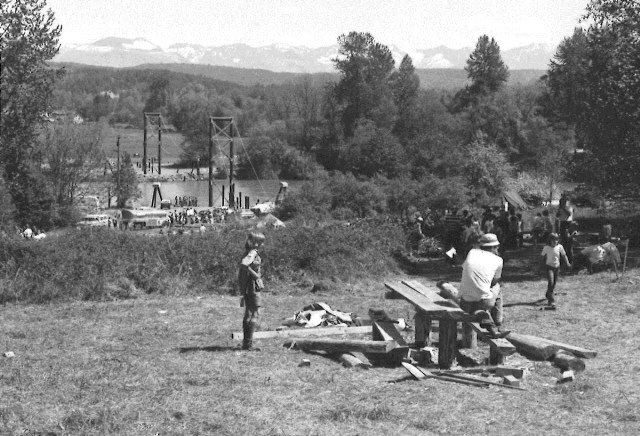 Scout encampment at Tolt River Park. After the day’s work, Scouts participated in traditional Camporee scoutcraft games and contests and competed in camping skills. May 1-2: Working on a shelter roof. This weekend Scouts from the Cedar River and Central Kitsap districts were on site. May 1-2: Early worries by leaders that older Scouts wouldn’t participate alongside the cubs proved unfounded. 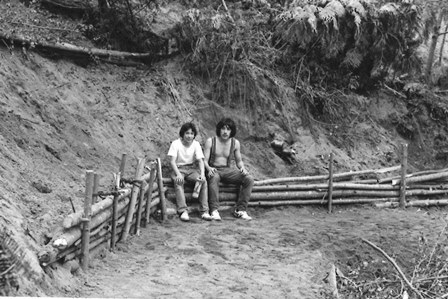 May 1: Scouts taking a break beside a trail they are building. 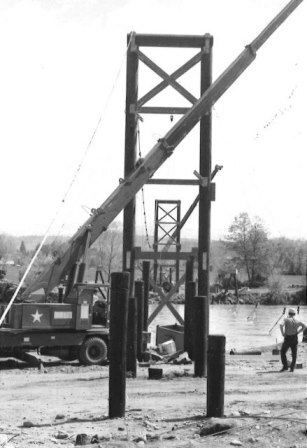 May 1-2: The Army Reserve began to raise the 54-foot high bridge towers. Here we see the bridge site seen through approach piers. May 1-2: Tower and cable work. May 1-2: The Army Reserve finished the towers and the main suspension cable work the second weekend of the project. May 8: Assembling a picnic table. Worksite panorama: main cables have been suspended from the bridge towers. 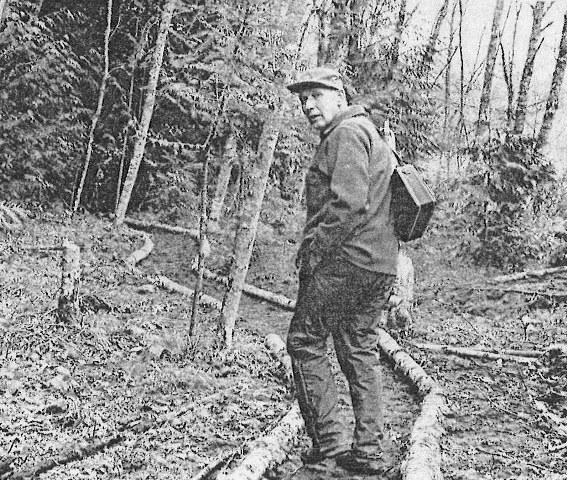 John MacDonald, on a trail built by the Scouts, spring 1976. Photocopied Seattle Times photograph originally published July 23, 1976. Series 468, Park System History Files, Box 1, Folder 60, King Count Archives. MacDonald, aged 61, suffered a fatal heart attack on May 10, 1976. 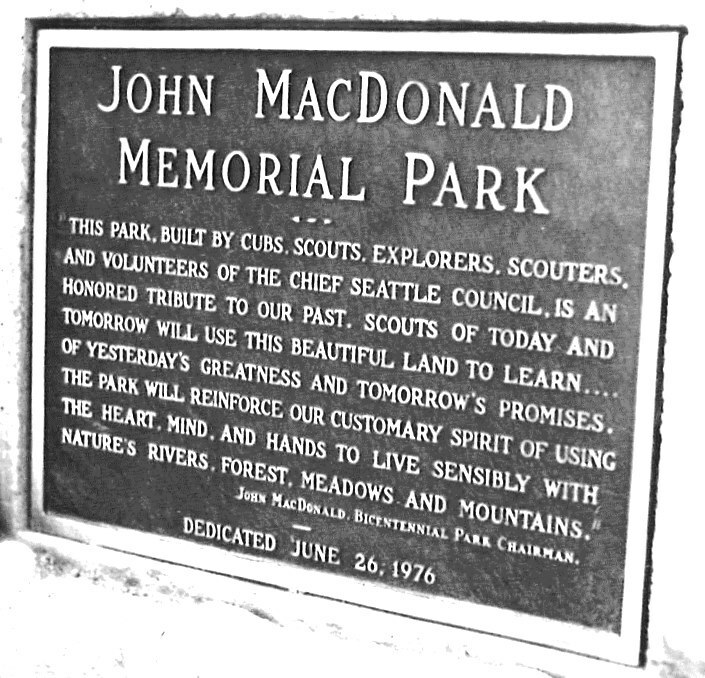 On June 1, the King County Council, honoring his “efforts and examples of community spirit,” added his name to the site known today as Tolt River–John MacDonald Park. The bridge deck as it begins extending from the west bank tower. 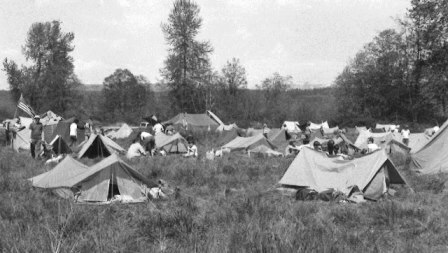 Scouts at camp, May 15. View from the top of the trail. 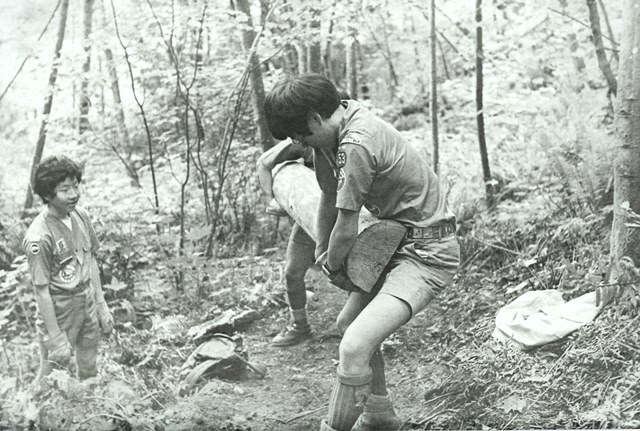 Members of Thunderbird Troop 53 from the Japanese Baptist Church move logs to the hilltop. Each trip took an hour and each group made the trip twice. Joining the bridge deck sections. 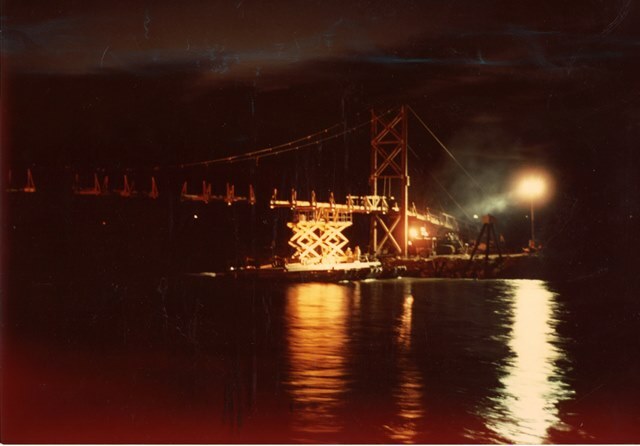 June 5-6: The Army Reserve had now finished the bridge, although not without some night work. Scouts contributed by nailing bridge deck flooring. Site development work was completed by Scouts from the Polaris District (northeast Seattle), the West Seattle District, and the Mount Olympus District of Clallam and Jefferson Counties. At the project’s end, 20,000 Scouts and adult leaders had put in some 75,000 hours of work. They had constructed forty hike-in campsites, five shelters and two large service centers; assembled ten picnic tables; opened miles of trails and drainage channels; and undertaken preliminary landscaping. King County estimated that the volunteer work had saved the county $1.5 million in labor costs. The large scale of the project, and the amount of community cooperation and coordination that had accomplished it, drew local, regional and even national media attention. 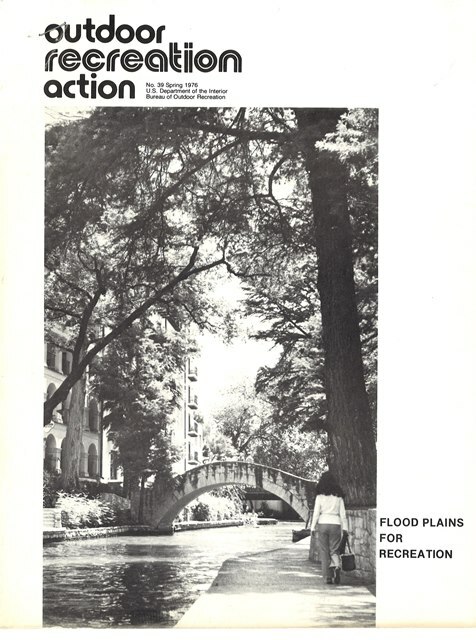 Some of the regional and national magazines which featured stories about the Bicentennial bridge project. 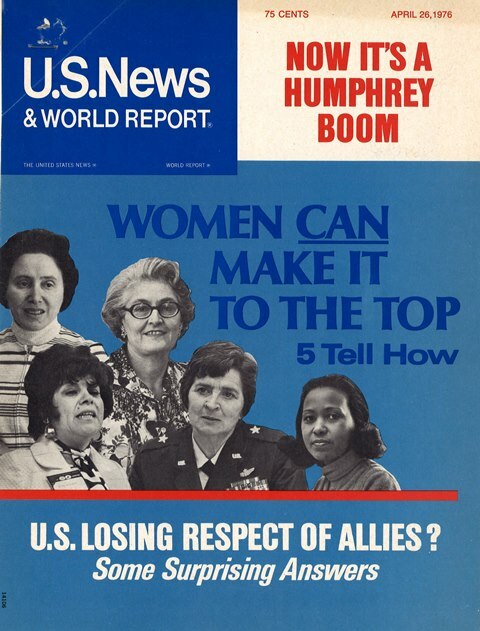 A feature story also appeared in the Scouting magazine Boys’ Life, October 1976. Series 468, Park System History Files, Box 1, Folder 63, King County Archives. Color guard crossing the bridge, June 26, 1976. Series 467, Park System History Files, Box 6, Folder 25, King County Archives. 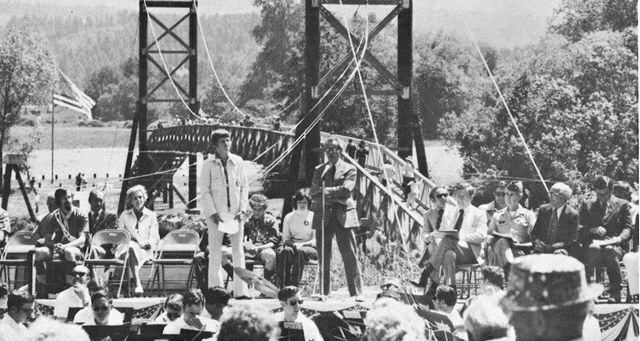 On a bright, sunny June 26, 1976, a crowd of 2,000 — County, Scouting and military representatives, members of local pioneer families, and onlookers — gathered to cross the new footbridge. A Scout color guard followed. 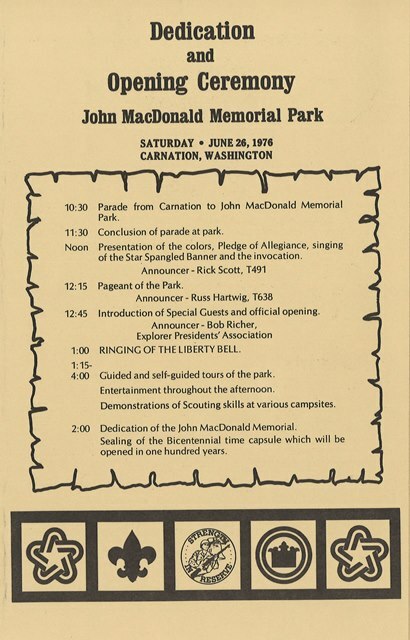 On the west bank of the Snoqualmie River, the U.S. Navy band played, a historical pageant of Native American and pioneer folklore was presented, a Liberty Bell replica was rung, a monument to John MacDonald was dedicated, and a time capsule containing names of project participants was buried. Mrs. MacDonald cut the symbolic ribbon, an unidentified Girl Scout declared the park open, and Boy Scouts showed off their hard work. Dedication program. June 26, 1976. Series 468, Park System History Files, Box 1, Folder 62, King County Archives. Aerial of the completed bridge, 1976. Series 467, Park System Photograph Files, Box 6, Folder 25, King County Archives. 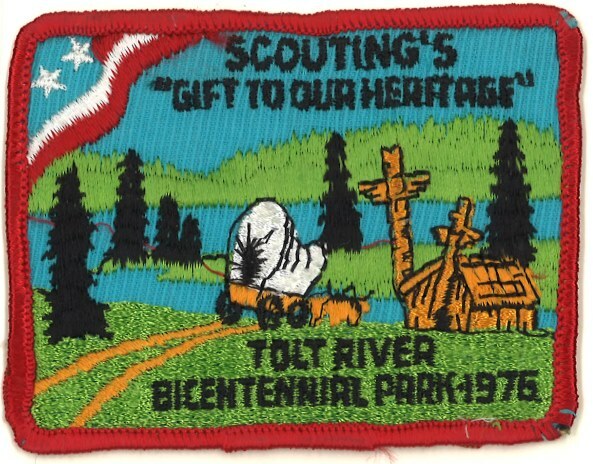 Boy Scout project badge, 1976. Series 468, Park System History Files,, Box 1, Folder 63, King County Archives. Memorial monument, Tolt River – John MacDonald Park. Series 467, Park System Photograph Files,, Box 6, Folder 25, King County Archives. 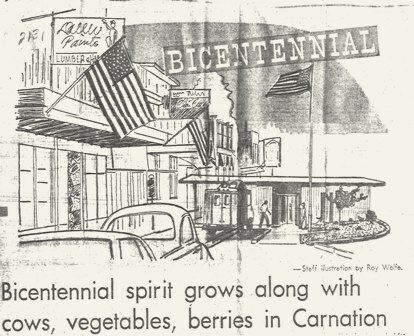 Where were you during the Bicentennial? 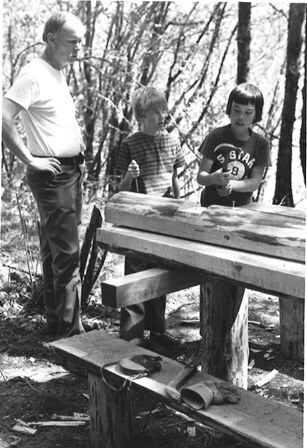 Were you a part of the Scouts or the Army Reservists who helped develop Tolt-Macdonald Park in 1976? Tell us about your experiences! Clipping files, 1973-1980, County Executive John Spellman. Series 45, King County Archives. Additional records from the administration of John Spellman are held by the Puget Sound Regional Archives, Bellevue, WA. History files, 1949-1997, King County Park System. Series 468, King County Archives. King County Document Collection. Series 872, King County Archives. Motion files, King County Council. Series 306, King County Archives. Ordinance files, King County Council. Series 305, King County Archives. Photograph files, 1900-2002. King County Department of Transportation, Road Services Division. Series 400, King County Archives. Photograph files, c. 1948-1998; King County Park System. Series 467, King County Archives. October is American Archives Month! The theme chosen by the Washington State Archives for 2016 is “we love parks.” This is the last of a series of four posts from the King County Archives on the history of King County Parks. 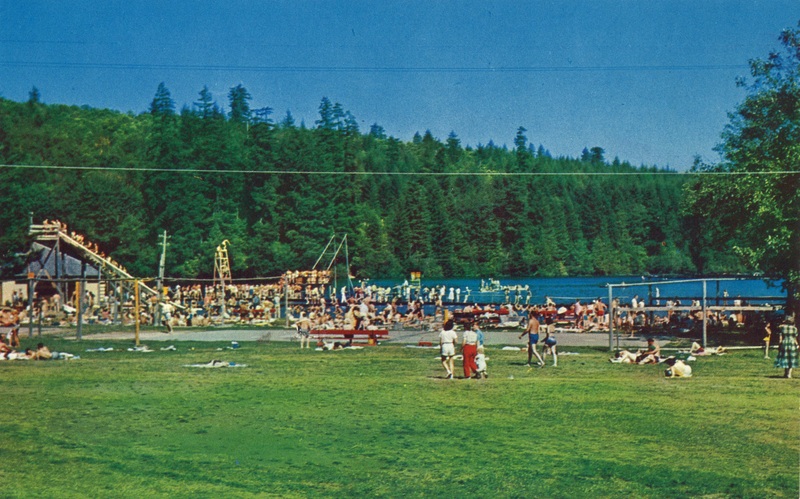 In the early 20th Century, lakes in the Maple Valley area were popular weekend destinations. Kane Gaffney, a musician, reportedly had been inspired to establish a resort at Lake Wilderness after performing in an outdoor concert there. So, in 1926, Kane and his brother Tom founded Gaffney’s Resort, which grew (taking over two other resorts on the lake) and prospered into the 1940s. At its peak, Gaffney’s saw upwards of 9,000 guests in a day. Kane Gaffney, 1907. Series 467, Park System Photographs, Box 23, King County Archives. Lake Wilderness had long been a getaway spot. The below map from 1907-08 identifies a summer cottage by the shore of Lake Wilderness, in the vicinity of the future Gaffney’s Resort. 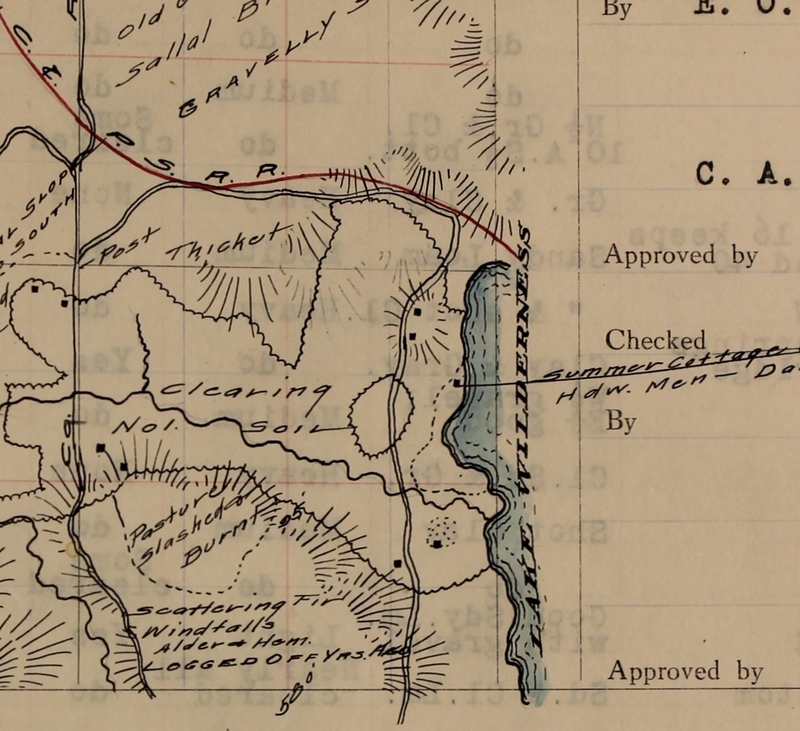 Section 21, Township 22, Range 6 East, 1907-1908. Series 1067, Assessor’s Timber Cruise Reports, Volume 17. King County Archives. 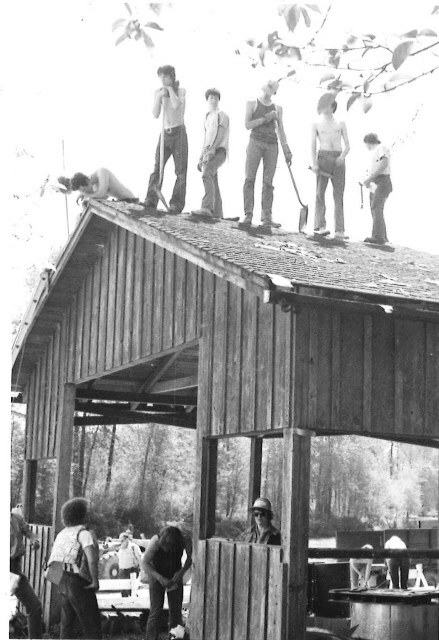 Gaffney’s Resort offered cabins, water slides, a dance hall, and a roller rink, and over time was expanded to include a golf course and an air strip. 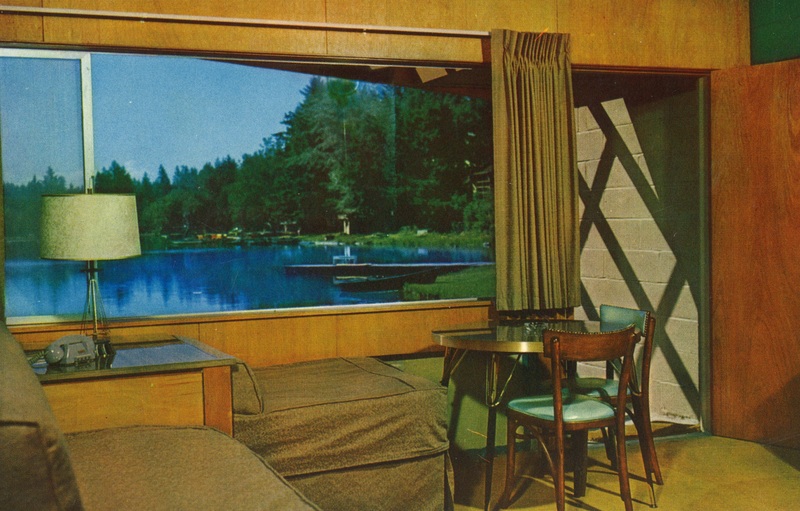 Postcards showing Gaffney’s Resort waterfront and cabin interior, circa 1940-1955. Series 472, Cultural History Research Project, Natural Resources and Parks, Department of: Recreation, Aquatics and Fairgrounds Division / Interpretive Program, Box 1, Folder 12, King County Archives. People from nearby cities and towns travelled to the resort by automobile, and during wartime gas rationing, many came by shuttle. Vacationers stayed in the lodge and in cabins, while locals would frequent the dance hall for weekend nights out. Plans for a new highway that would link the area to Seattle and Tacoma promised even more business, and, anticipating changing demand, the Gaffney’s invested in a new 20,000 square-foot lodge that could serve as a modern conference facility. 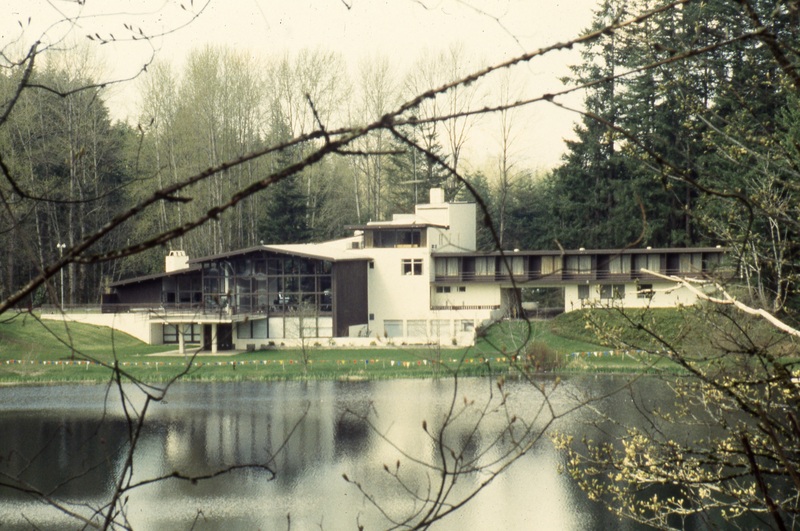 View of lodge from across Lake Wilderness, 1997. Series 1803, Photograph files: historic landmark nominations, Office of the Executive: Office of Business Relations and Economic Development / Historic Preservation Program, Box 2, Folder 10, King County Archives. Designed by architects Young & Richardson, Gaffney’s Lodge earned a National Honor Award from the American Institute of Architects in 1952, and architectural trade journals lauded its modern design. In 2003, the lodge was listed in the National Register of Historic Places as an early example of the Pacific Northwest Regional Style of the Modern movement. Young & Richardson’s plans showing elevations of the sections of Gaffney’s Lodge, 1948. Series 1848, Parks plans, Department of Executive Services Facilities Management, Real Estate Services, King County Archives. A principle of Modernism held that a building should not be imposed upon a space but should instead relate to the landscape and reflect its locale. With its asymmetrical design and use of local materials, the Lake Wilderness Lodge responded gracefully to its surroundings. Plot plan for Gaffney’s Lodge, 1948. Series 1848, Parks plans, Department of Executive Services Facilities Management, Real Estate Services, King County Archives. The lodge interior related to the out of doors by providing a dramatic view of the lake from a convention hall that could seat 600, as well as a quiet transition from sleeping quarters to a forested area outside. Side view of lodge, 1997. Series 1803, Photograph files: historic landmark nominations, Office of the Executive: Office of Business Relations and Economic Development / Historic Preservation Program, Box 2, Folder 10, King County Archives. Another tenet of Modernism was to reject superficial ornamentation. Beauty was seen in unity of design, material, and purpose. Manufactured furnishings and structural features such as support beams and joints were not hidden, and their display demonstrated respect for materials and their utility. 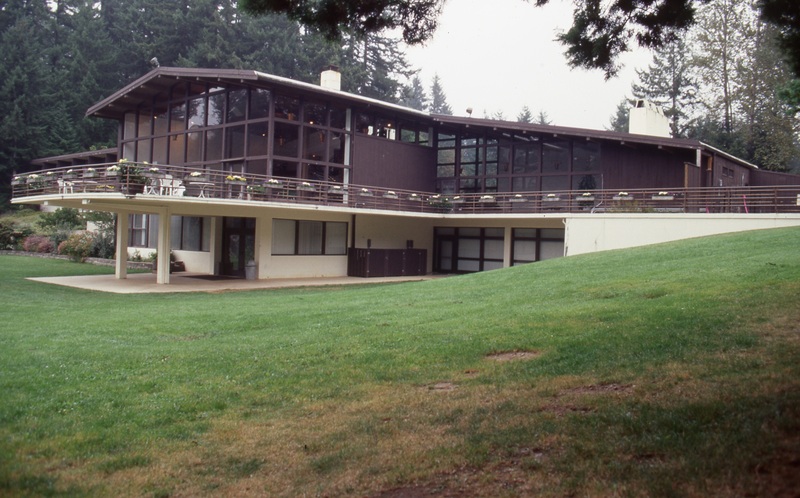 Though at the time the architects described the building as resembling “Swiss Alpine” architecture, Gaffney’s Lodge helped define an emerging Northwest Modern style. Industrial, manufactured elements, such as concrete posts, steel pipes, and large window panes, were combined with regional materials like hand-split cedar from local forests, and the overall design centered around an artwork based in the region’s Native American traditions. 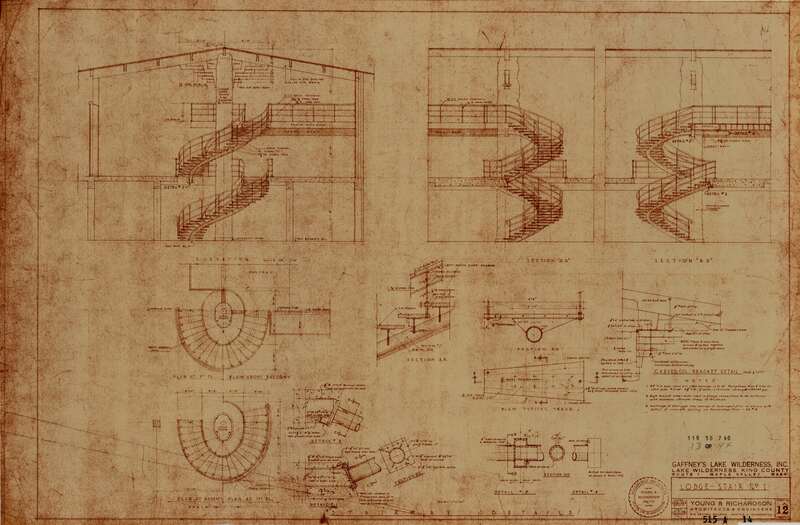 Detail from drawing for column and main stairway of Gaffney’s Lodge, 1948. Series 1848, Parks plans, Department of Executive Services Facilities Management, Real Estate Services, King County Archives. 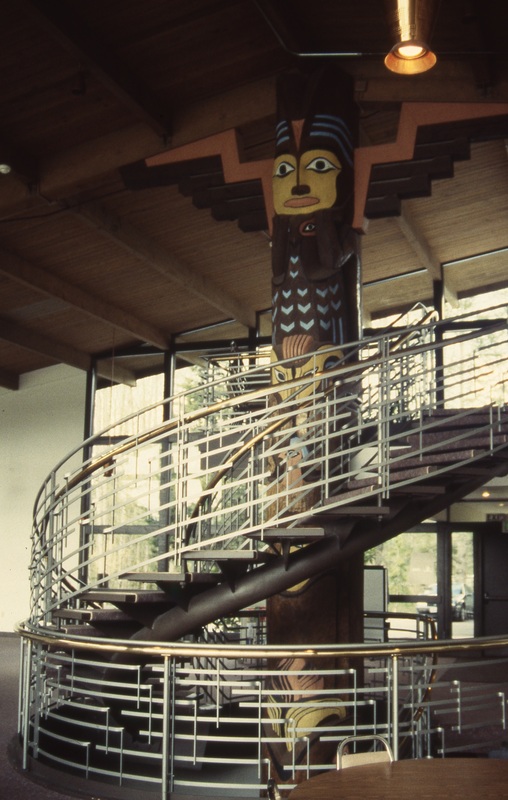 Artist Dudley Carter sculpted the central column that spanned three stories and served as the lodge’s central structural support, rising to the ceiling through a free-standing staircase. In describing the work, Carter explained how traditional Northwest Native American design and technique aligned with Modernist principles. 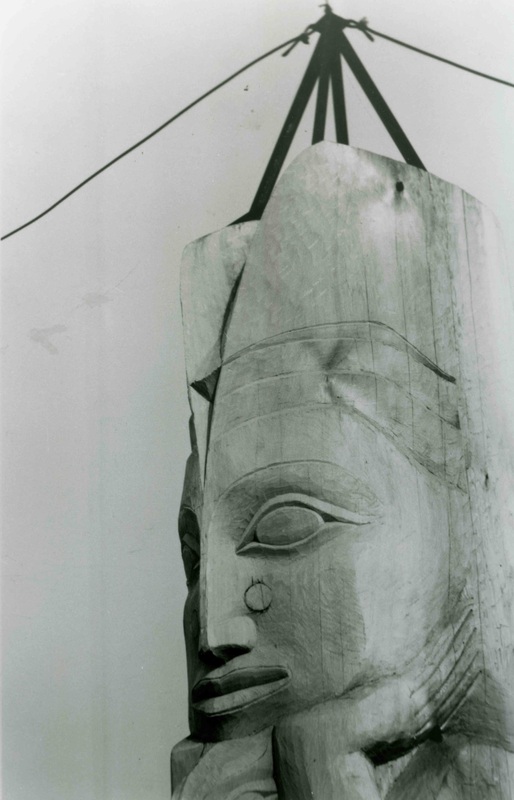 Dudley Carter carved the column from a 35-foot cedar trunk that was five feet in diameter at the base. 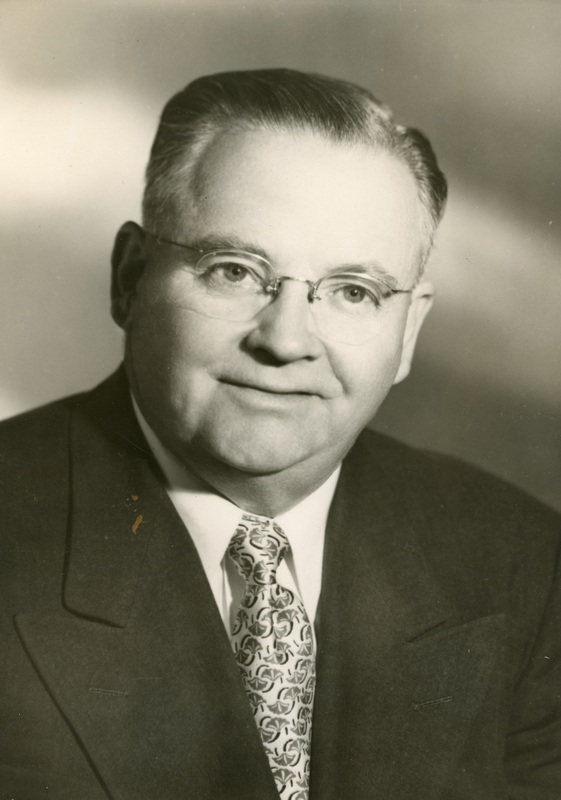 He worked in public at the 1949 King County Fair, held in Enumclaw. The photographs here show the carving in progress. 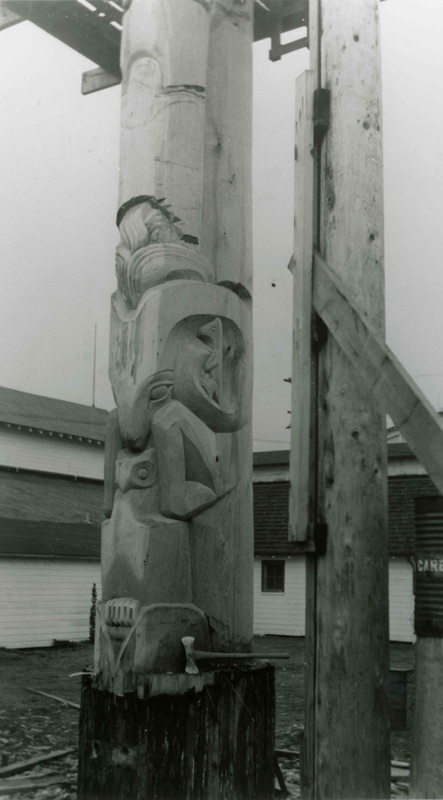 Carving of pole for Gaffney’s Lodge by artist Dudley Carter at King County Fair, 1949. Series 468, Park System History Files, Box 1, Folder 9, King County Archives. Transcription of artist’s statement by Dudley Carter provided to Young & Richardson circa 1948-1949. 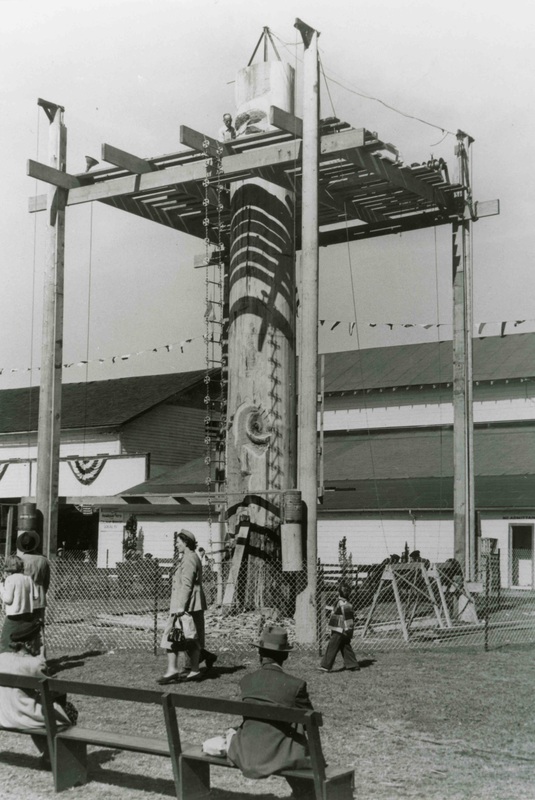 Series 472, Cultural History Research Project, Natural Resources and Parks, Department of: Recreation, Aquatics and Fairgrounds Division / Interpretive Program, Box 1, Folder 12, King County Archives. The lodge’s Tillicum Room lounge also employed motifs derived from Northwest Native American art. 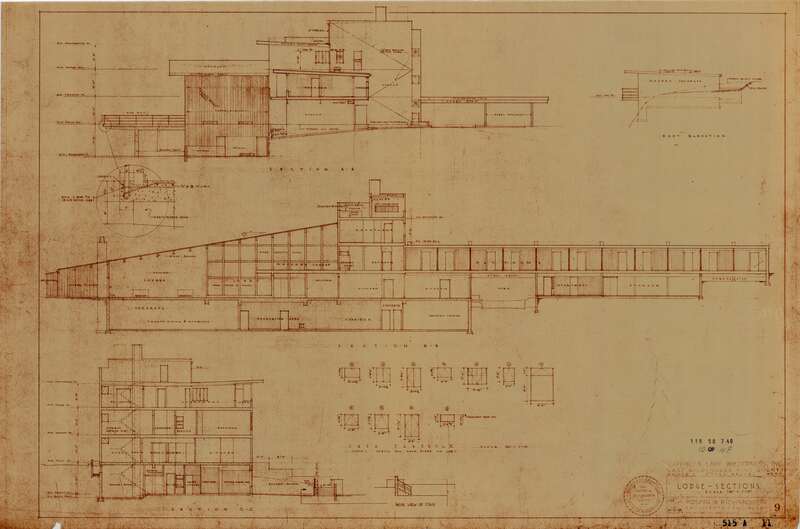 Details from plan for the Tillicum Room lounge at Gaffney’s Lodge, 1948. 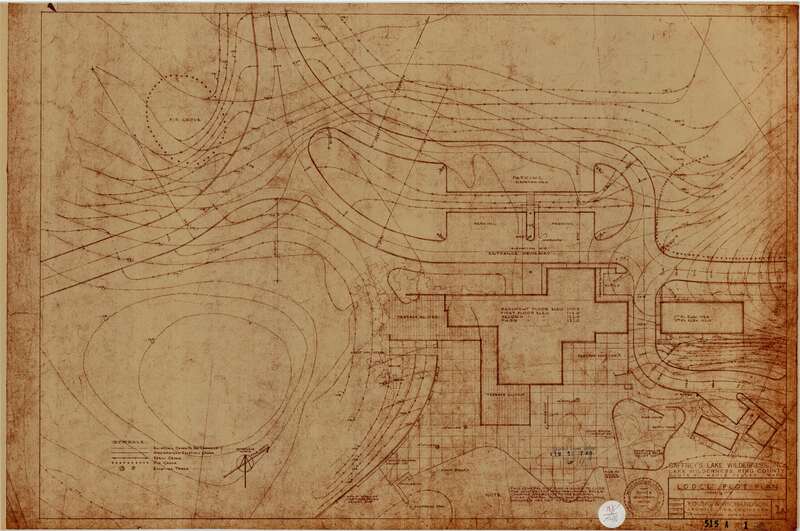 Series 1848, Parks plans, Department of Executive Services Facilities Management, Real Estate Services, King County Archives. Some 8,000 people had attended the lodge’s 1950 opening celebration that included an air show utilizing the new air strip near the building. But over the next decade, the resort’s popularity declined. In 1966, King County was able to purchase the property through federal grant funding under the Housing Act of 1961, which supported preservation of open space near growing urban areas. The same year, the Lake Wilderness Arboretum Foundation was established and began development of an arboretum adjacent to today’s Lake Wilderness Park. King County managed the 100-plus acres of open space and leased the lodge to the University of Washington for its extension program. From photocopy of clipping from the Everett Herald article dated March 1, 1969. Series 472, Cultural History Research Project, Natural Resources and Parks, Department of: Recreation, Aquatics and Fairgrounds Division / Interpretive Program, Box 1, Folder 12, King County Archives. The Everett Herald described the center in 1969 as “a comfortable, modern building of glass and concrete….designed and operated solely to provide an atmosphere and surroundings to aid intellectual pursuits,” hosting over 70 academic conferences a year. After 20 years, in 1986, the University did not renew its lease, and with funding needed for upgrades and asbestos removal, the County and the community debated the lodge’s future. A private company, Sportsmind Inc., which provided coaching and training to corporate and military clients, bid to lease the building for weekend retreats. Senior housing was another possibility, and there was popular support for an “Unlimited Hydroplane Hall of Fame and Museum.” The lodge finally was retained and renovated by King County, including making newly required safety and accessibility improvements, and was operated as a community center. In 1997, King County designated the lodge an official historic landmark. Through its acquisition of the land and decades of stewardship, King County ensured preservation of not only the culturally significant Lake Wilderness Lodge, but also the swath of picturesque lakeshore that has served as a recreation spot for over a century. 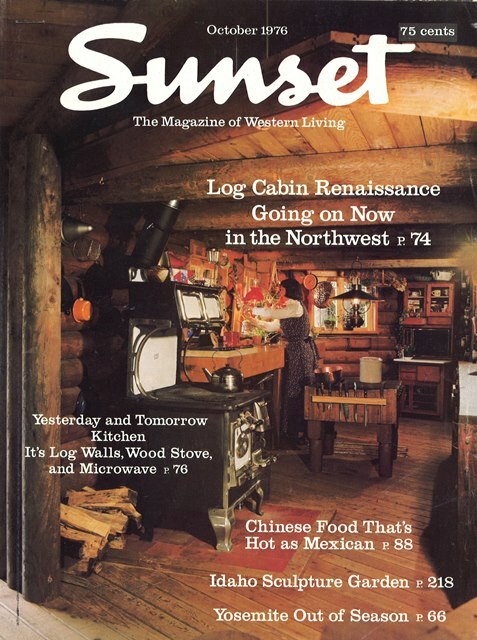 In 2003, Lake Wilderness Park and the lodge were transferred to the recently incorporated City of Maple Valley. The park continues to provide open space and a variety of recreation opportunities in the rapidly growing suburban city, and the lodge remains a popular venue for weddings and other events. The 1907-08 Timber Cruise map at the beginning of this post also notes the line of the Columbia & Puget Sound Railroad, labeled “C. & P.S.R.R.” In the 1970s, in an early rails-to-trail conversion, this line became King County’s Cedar to Green Rivers Trail that connects the Cedar River Trail to Lake Wilderness. The below record series were used in researching this post. Series descriptions can be searched using our online collection database at archivesearch.kingcounty.gov. Series 306, Motion Files, King County Council: Relating to the King County Park System: Adopt Lake Wilderness Master Plan, 12/18/1989. Series 467, Park System Photograph Files. Series 468, Park System History Files. Series 472, Cultural History Research Project, Department of Natural Resources and Parks, Aquatics and Fairgrounds Division / Interpretive Program. History of Lake Wilderness & the Surrounding Communities, Transcription of taped interview: Bud Byers of the Maple Valley Historical Society. 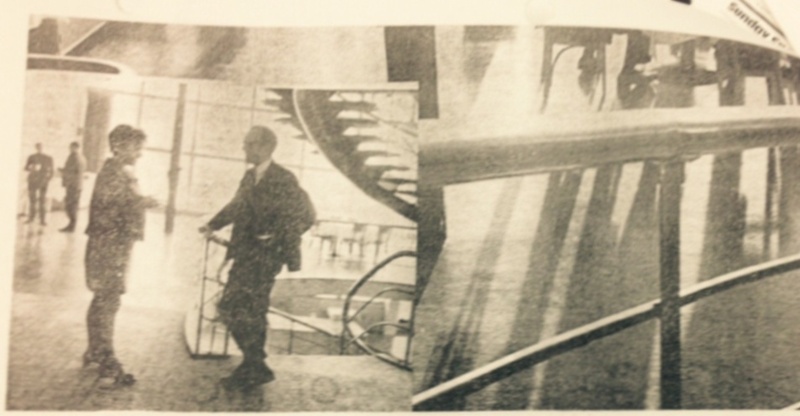 Recorded 7/31/95 by Holly Taylor (PDF copy of document from Series 472). Series 872, Document Collection: [Document 1296] Lake Wilderness Master Plan / Draft Master Plan Report, Executive Summary, King County Natural Resources and Parks Division (1989). Series 872, Document Collection: [Document 4912] Artist-made building parts project / to revive, promote and encourage the integration of art and architecture / [catalogue] (1996). Series 992 , Box 2, Charles Payton administrative working files, Cultural Resources, Office of: Landmarks and Heritage Commission / Office of Historic Preservation King County Comprehensive Cultural Plan, Lake Wilderness Conference Center, Preston: mill and proposed arboretum, Seattle Center levy. Series 1067, Assessor’s Timber Cruise Reports, 1907-1908. Series 1803, Photograph files: historic landmark nominations, Office of the Executive, Office of Business Relations and Economic Development / Historic Preservation Program. Series 1848, Parks plans, Department of Executive Services, Facilities Management Division / Real Estate Services. The theme chosen by the Washington State Archives for 2016 is “we love parks.” This is the third of a series of four posts from the King County Archives on the history of King County Parks. At the center of the Seattle Defense Area, King County was home to at least seven Nike missile installations between 1956 and 1974, most of which became county or city parks after decommissioning. The former Nike sites at Cougar Mountain and Lake Youngs were both taken over by King County Parks and developed into recreational areas for the benefit of the public. 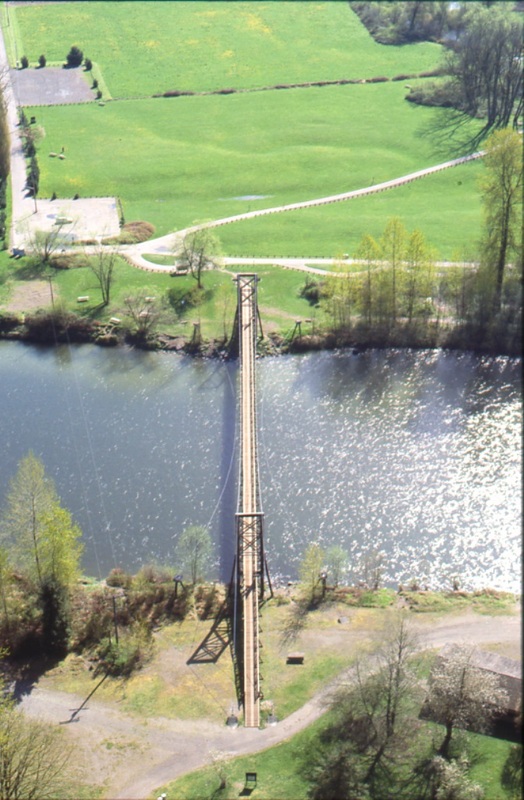 Bird’s-eye photograph of Cougar Mountain, 1982. Taken from near just southeast of the intersection of SE May Valley Rd & SR 900. Series 1629, Box 1, Folder 1. The rapid stockpiling of American and Soviet missile arsenals that came to define the Atomic Age raised the possibility of sudden, decisive strikes that all but guaranteed long-term, widespread devastation for the government caught off-guard. American resources were invested not only in civilian defense, but into building an arsenal, ensuring the promise of mutually assured destruction and deploying dozens of defensive conventional and nuclear missile silos around major coastal cities and military installations. Siting the installations during early planning phases was problematic; launch sites needed to be located in defensive rings around major cities and critical sites, but also required 119 acres per site. By the time the Ajax and Hercules sites of the Seattle Defense Area were built, architect Leon Chatelain, Jr., had designed underground sites that not only provided first-strike protection to the command and control facilities, but also decreased the necessary amount of land to 40 acres and allowed the sites to be located closer to the cities they defended. King County acquired the former Nike sites through multiple transactions between the 1960s and the 1980s. The current site of Petrovitsky Park was once part of the Lake Youngs dual launch and control sites, stocked with Ajax surface-to-air missiles and operational between 1956 and 1961. Grandview Park and Kent Mountain View Academy in SeaTac are located on land acquired from King County after the Army decommissioned the former site of S-43, the Kent/Midway Ajax launch installation. Arguably the crown jewel of the King County Parks system, Cougar Mountain Regional Wildland Park encompasses the sites of the former Ajax missile launch and control facilities known as S-20. 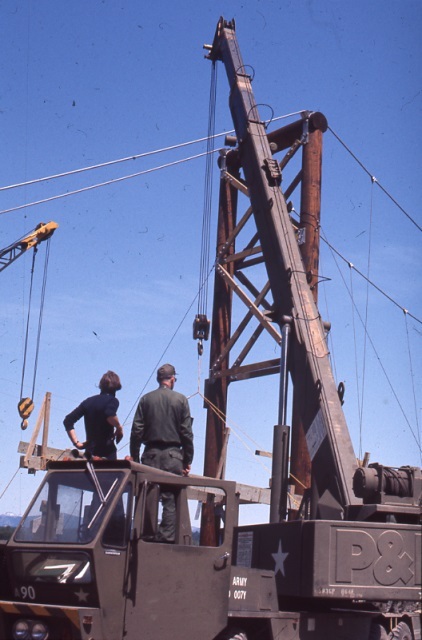 Like Petrovitsky Park, the Cougar Mountain area had experienced active coal mining in the late 19th and early 20th centuries and became anti-ballistic missile installations during the late 1950s and early 1960s. During construction of the underground missile storage vaults, Army contractors reportedly filled two open mine shafts with concrete to seal the openings and stabilize the area. 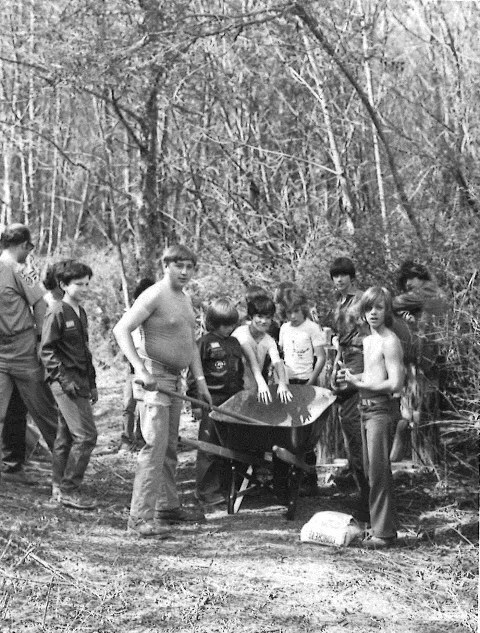 Deactivated in 1964, both the control and launch sites at Cougar Mountain were acquired by the King County Parks and Recreation Division and turned into the upper and lower park areas in 1983. In 1993, Parks partnered with the Army Corps of Engineers and government contractors on an environmental project at the former control site: removing the mess hall, latrine, and assembly and test buildings; pumping water out of the missile vaults; and seeding the launch area to cover it with grass. Some of the upper site remains. Aerial photographs of S-20 Cougar Mountain/Issaquah, ca. 1970s-1990s. 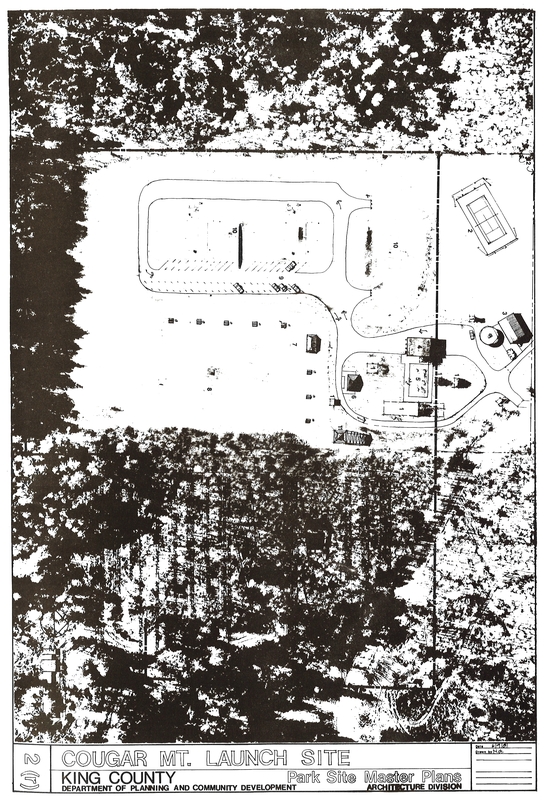 Left: control site near Anti-Aircraft Peak; right: launch site off of Clay Pit Rd. Series 900, Rolls 25 and 26. Instead, the green spaces are there because the overall metropolitan complex needs them and ‘forward thinking decision makers’ have preserved them. . . . It is not any individual specific scene or composition that is captivating [at Cougar Mountain]; rather, visitors are taken by the mountain’s aggregate extent, its variety and landscape complexity and its many-acred largeness. Miles of trails, expansive views of the region, and distinctive terrain characterize this landscape, and it is one of the few sites in King County with such an abundant diversity of native Washington plants. Today, Cougar Mountain Regional Wildland Park contains 3,100 acres of public wildland, connected to Squak Mountain State Park for a total of 5,000 acres of land protected for the enjoyment of all. Selections from Series 467, Photograph files of the King County Parks System, Cougar Mountain, Box 2, Folder 24. Cougar Mountain Regional Wildland Park in King County, Washington, http://www.kingcounty.gov/services/parks-recreation/parks/parks-and-natural-lands/popular-parks/cougar.aspx. Fred Weinmann, “Cougar Mountain Regional Wildland Park—Marshall Hill Trail, DeLeo Wall and Redtown Meadow — April 20,” Washington Native Plant Society (Seattle, WA), http://www.wnps.org/cps/walks/apr-02.html, updated 3 Jul 2016. 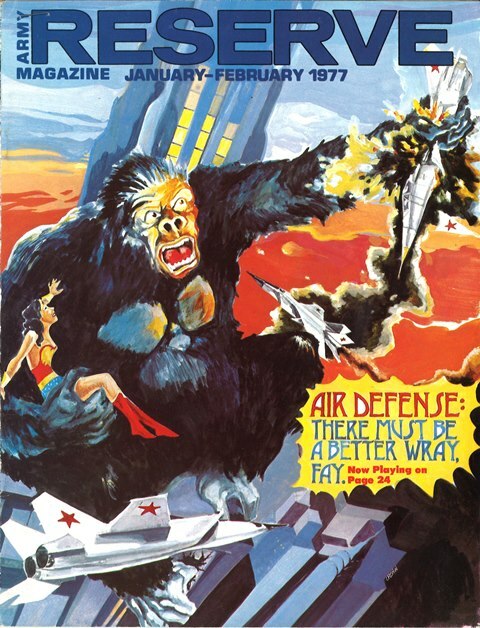 John C. Lonnquest, David F. Winkler, and Julie L. Webster, “To Defend and Deter: The Legacy of the United States Cold War Missile Program” (Washington, DC, 1996). 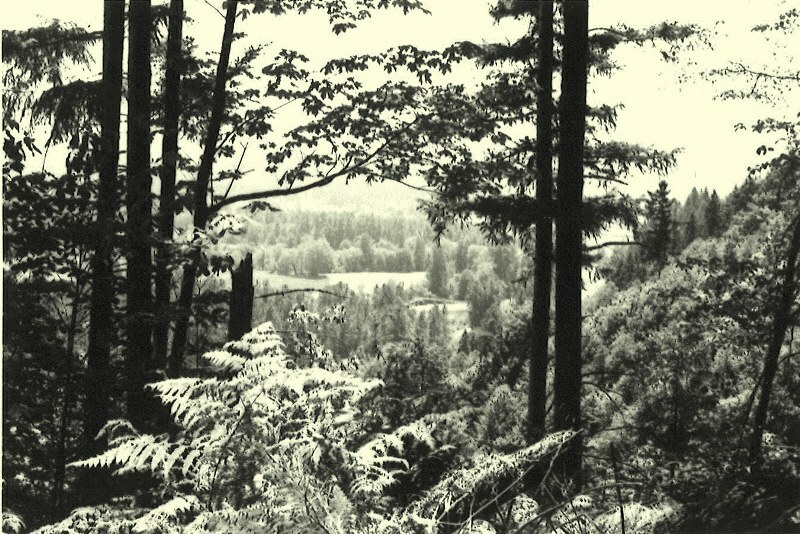 Study: “Cougar Mountain Regional Park,” King County Parks and Recreation Division (Seattle, WA, 1981). Memo from Steve Williams to Randy Schroers, Bud Parker, and Ron Erickson (30 Nov 1992). 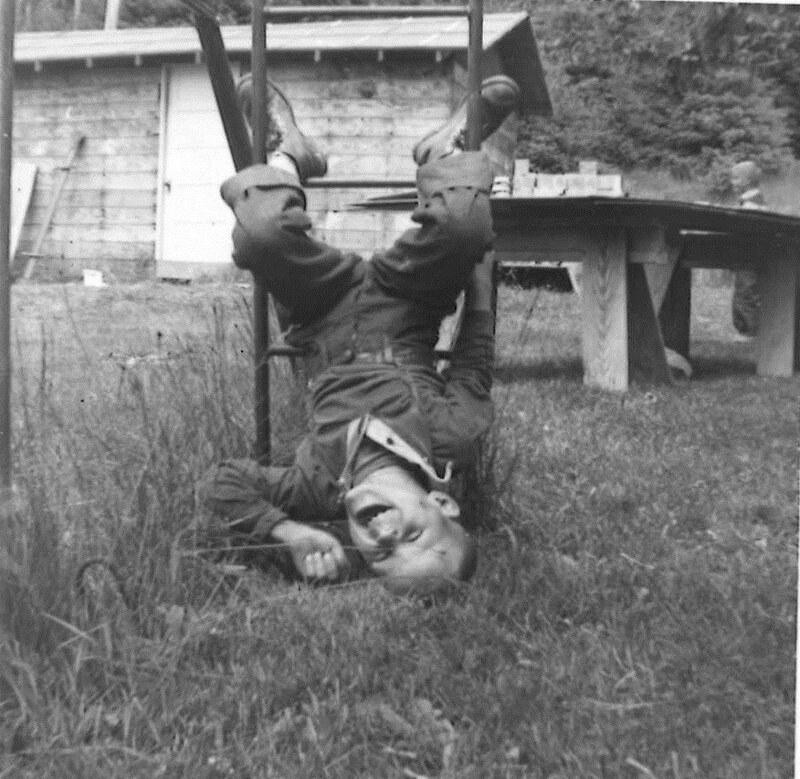 The theme chosen by the Washington State Archives for 2016 is “we love parks.” This is the second of a series of four posts from the King County Archives on the history of King County Parks. Camping program participant, c. 1958-1960. Series 467, Box 14, Folder 6. 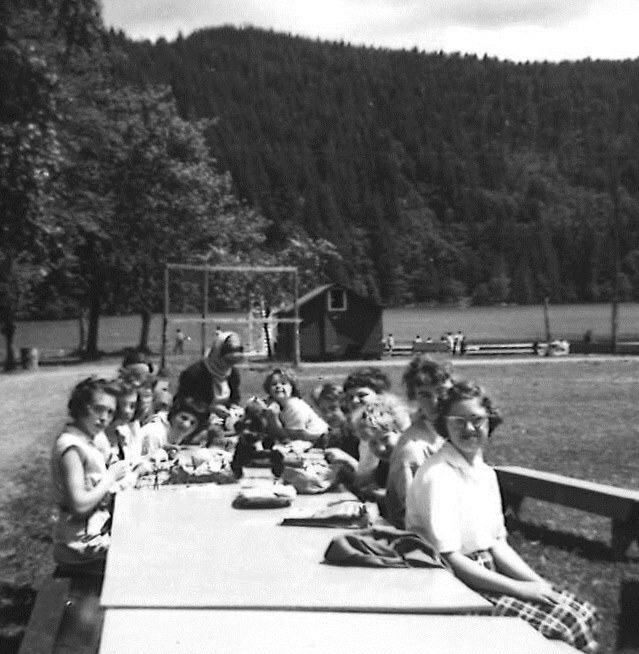 In the postwar 1950s, King County Parks oversaw a robust program of organized recreational activities. Under departmental leadership emphasizing innovation and expansion, recreation opportunities were extended to new, under-served groups of county residents, including girls and women, senior citizens – and youths with disabilities. 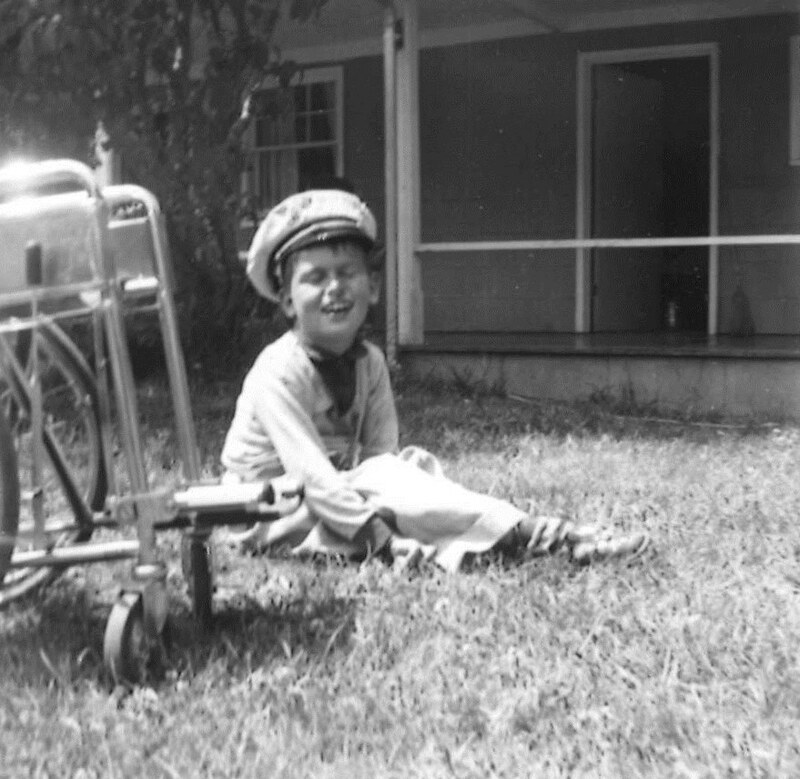 A happy camper, c. 1958-1960. Series 467, Box 14, Folder 6. 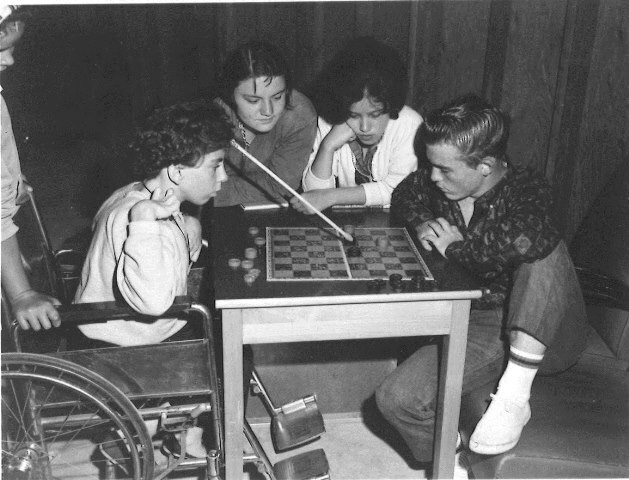 “Adapted recreation” for people with disabilities, both physical and intellectual, was an extremely novel idea in a time when these individuals were often regarded with only pity and were not well integrated into society at large. 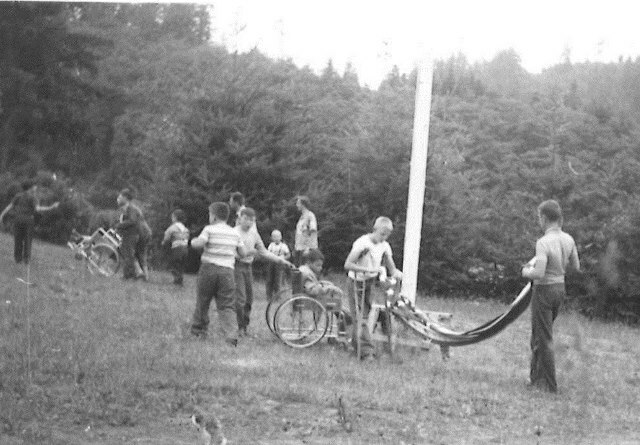 In 1958, King County’s recreation leaders launched the pioneering adapted recreation program, the only such year-round program in the Pacific Northwest, and the first in the region to be sponsored by a public agency. In its initial year, 86 children with physical disabilities participated. In two years, participation tripled as children with intellectual disabilities were welcomed into the program. Patricia Karrasch, recreation program director. Swimming program participants, c. 1960. Series 467, Box 14, Folder 6. Recreation leaders encouraged the participation of abled youths alongside those with disabilities. Interaction among the groups was promoted as a social good that fostered inclusivity and acceptance. The program’s philosophy further permitted any participant to try any activity. If one activity wasn’t successful, another was offered in its place. 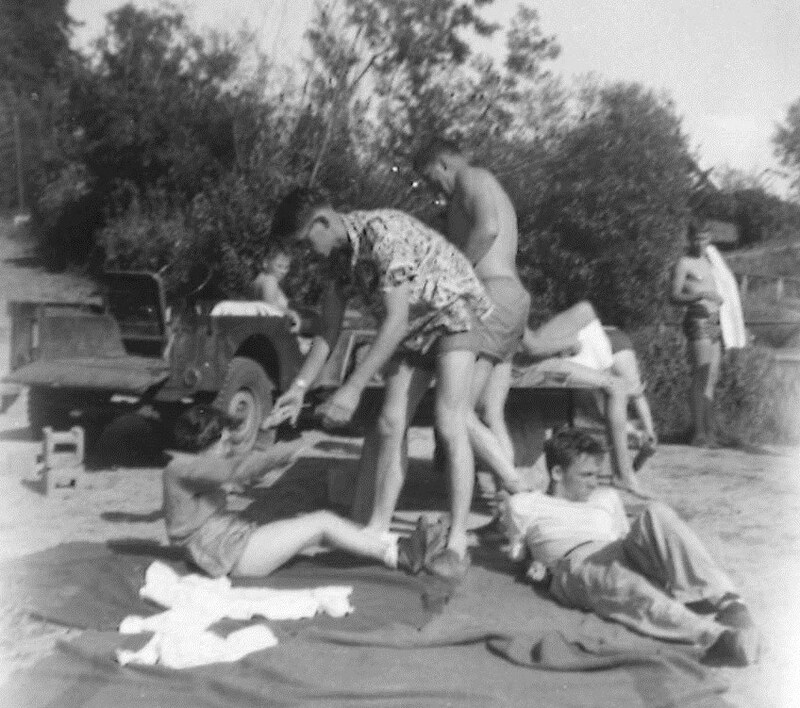 Earliest activities included games, training in crafts, and structured social events. Team and individual sports, such as softball, track, tennis and bowling were swiftly added and many more would follow. 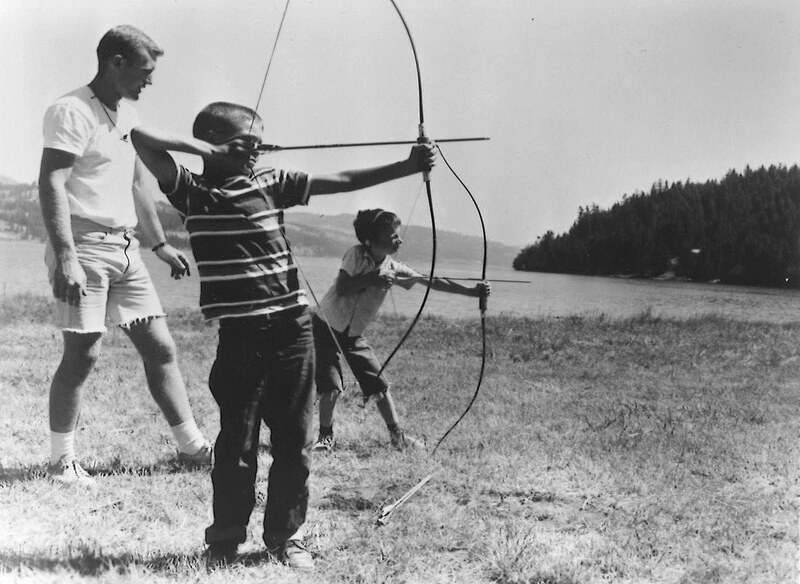 Top: Archery practice, circa 1950s, Series 467, Box 14, Folder 5. Bottom left: Flag raising at camp, circa 1958-1960, Series 467, Box 14, Folder 3. Bottom center: Doing crafts, Camp Lutherwood, circa 1958-1960, Series 467, Box 14, Folder 8. 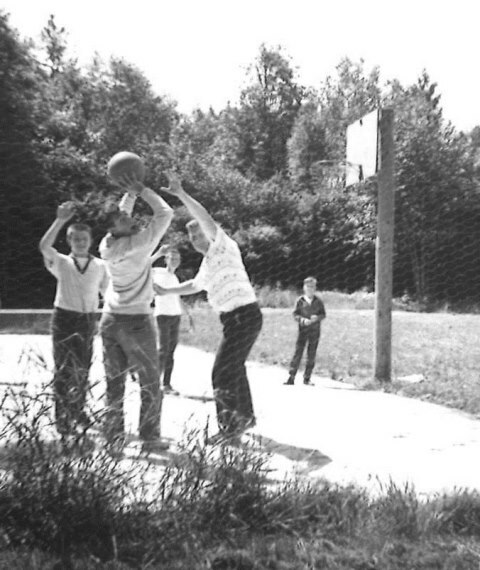 Bottom right: Basketball at Camp Lutherwood, circa 1958-1960, Series 467, Box 14, Folder 8. King County Parks’ popular and successful swimming program was extended to adapted recreation, not only as an individual activity, but soon as a competitive sport. This drew national attention. 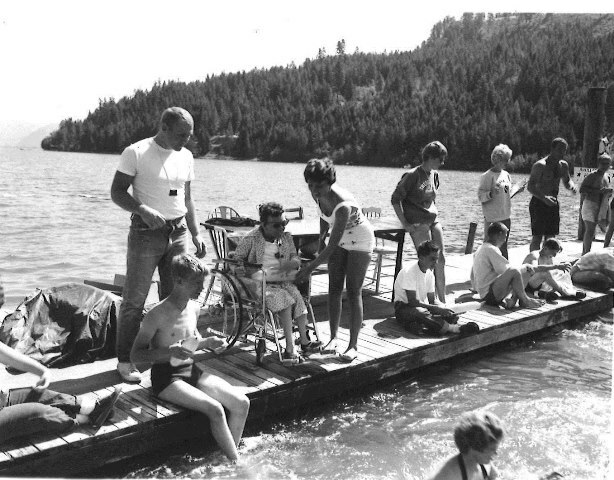 In the mid-1960s, when the Joseph P. Kennedy Jr. Foundation was developing the first nationwide Special Olympics for youth with intellectual disabilities, planners sought out King County’s recreation specialists to learn how to stage a swimming competition. Two of the seven events at the first Special Olympics games were swimming. Swimming program participants and helpers, probably at Camp Lutherwood; circa 1960. Series 467, Box 14, Folder 5. Listen to Patricia Karrasch, recreation director for King County Parks in the 1950s and 1960s, talk about the competitive swimming program and other aspects of recreation for people with disabilities, and how the Parks program contributed to the first Special Olympics. Interview with Patricia Karrasch, April 19, 1989. Series 50, Department of Parks, Planning and Resources, Parks Division, Oral history interviews, Box 2, tape 1, King County Archives. Providing opportunities for youth to travel by air to camps and other destinations was already component of the adaptive recreation program. 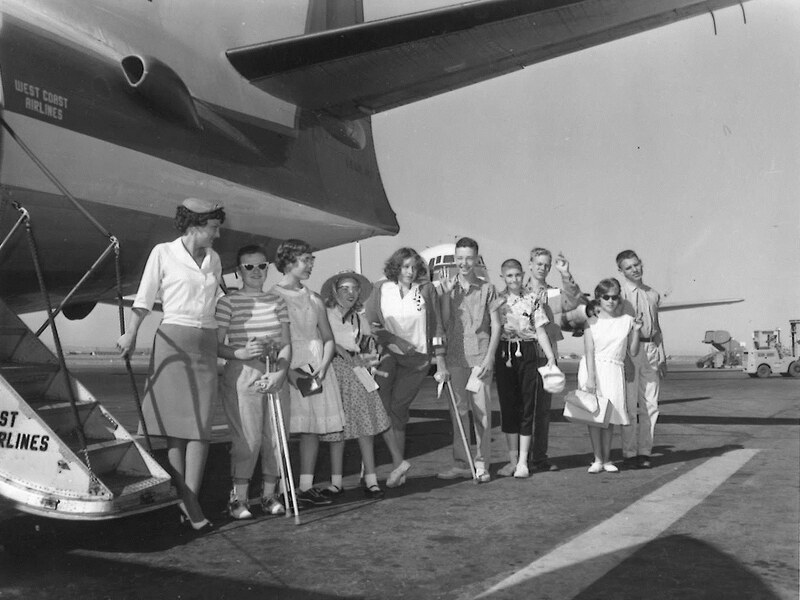 Parks program participants ready for departure from Seattle’s Boeing Field, circa 1960. Series 467, Box 14, Folder 5. In 1968, 90 young athletes from Washington State — about 10 to 14 from King County — traveled to Chicago for the first Special Olympics via the team plane of the University of Washington Huskies. The models of the Special Olympics, and the older Paralympic Games for athletes with physical disabilities, were replicated at the state level in the 1970s and 1980s through the Washington Wheelchair Games and the Washington Games for Physically Disabled Citizens. King County endorsed the games and helped stage them; many county citizens participated. 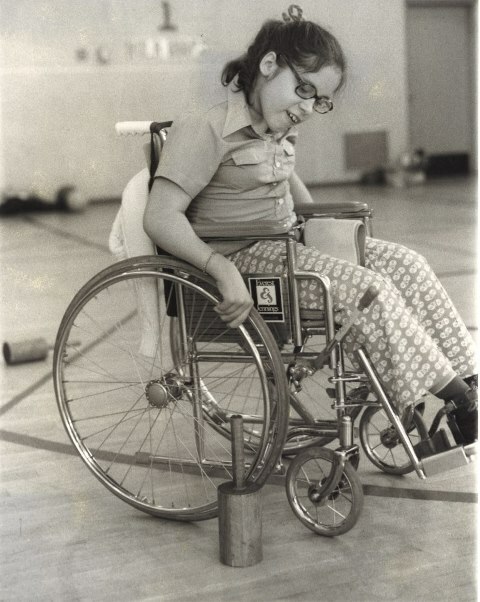 Lowell Elementary School student practicing for the 1977 Washington Olympics for the Physically Disabled. Series 467, Box 21, Folder 2. 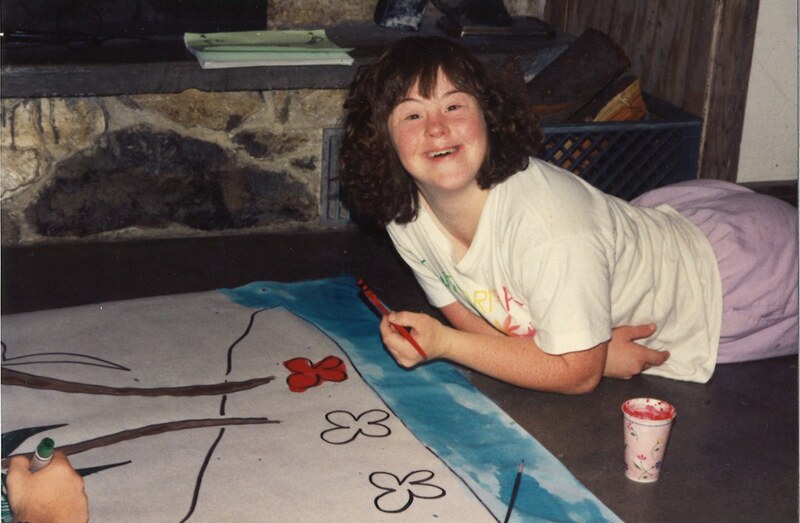 As programs for persons with disabilities grew in schools and other public and private organizations, King County Parks continued its own program. At its peak, in the early 1980s, almost 30,000 participants enjoyed a wide range of activities. Over time, and with the passage of the Americans with Disabilities Act in 1990, individuals with disabilities achieved new rights, greater visibility, and opportunities alongside all citizens. During the same time, while King County Parks moved away from organized recreation and toward land stewardship through the creation of regional parks and trails, new accessible designs enabled increased recreational use of County parks by individuals with disabilities. As Seattle prepares to host the 2018 Special Olympics, King County can look back proudly at its pioneering role in special recreation. 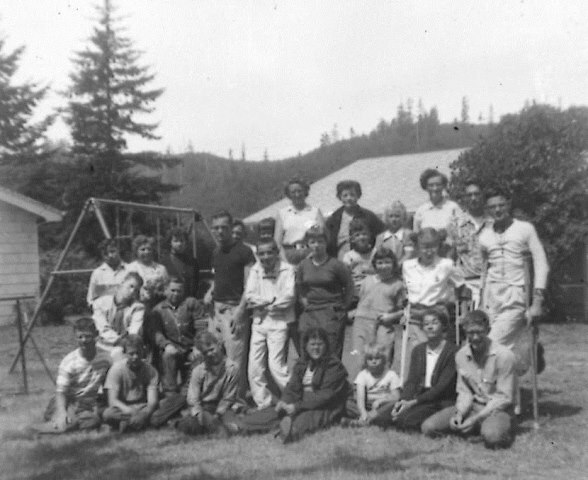 Campers and staff at Camp Lutherwood, c. 1958-1960. Series 467, Box 14, Folder 6. Did you or a family member participate in King County’s adapted recreation program, the Special Olympics or other athletic competitions? Tell us about your experiences by replying below! Annual reports, 1948-1985; King County Parks and Recreation Department. Series 1714, King County Archives. Interviews with Patricia Karrasch, Tom Ryan and George Wyse, 1988-1991; King County Department of Parks, Planning and Resources oral history interviews. Series 50, King County Archives. Photograph files, c. 1948-1998; King County Parks System. Series 467, King County Archives. “County Parks Sets Meet for Retarded Youth,” May 26, 1968. “Chicago ‘Special Olympics’ Set for Retarded Children,” June 2, 1968. “State Youths to Compete in ‘Olympics,’” June 27, 1968. The theme chosen by the Washington State Archives for 2016 is “we love parks.” This is the first of a series of four posts from the King County Archives on the history of King County Parks.